Dutch Treat Foods creates handcrafted, fresh food products that bring people to the table. For over 30 years, Dutch Treat Foods has been producing handcrafted, fresh food products for customers throughout the midwest. We are a second generation, family-owned company that believes the best moments in life happen around the table, which is why we create delicious, fresh food products that bring people to the table. If you are interested in learning more about our company or our products, please feel free to shoot us an email, give us a call, or stop on by our Zeeland, Michigan production facility. We'd love to hear from you and learn more about how we can serve you. Dutch Treat Foods manufactures a variety of fresh food products, including potato salads, pasta salads, slaws, hummus, salsa, baked beans, cheesy potatoes, apple sauce, and many more. Take a look at our product gallery below to learn more about the products that we produce. Just like grandma used to make it! The perfect mixture of diced potatoes, chopped eggs, and garden-fresh vegetables in a mustard-based dressing. It's even better than homemade! If you love redskin potatoes, then you will love this! We start off with fresh redskin potatoes, diced eggs, vegetables, and a variety of herbs and spices. We finish it off with our signature sour cream-based dressing. A definite pleaser! This is a potato salad like none other! We make it in our kitchen with fresh vegetables and jalapeno peppers to give it just the right “kick.” Cheddar cheese packets are included to add to the salad on site. Fabulous! A sweet take on our classic potato salad. We start with fresh potatoes, add fresh vegetables, and toss it in our secret Heidi's dressing. A delicious twist on our original potato salad. Fresh potatoes, cheddar cheese, crispy bacon, and fresh vegetables tossed in our amazing sour cream dressing make this salad perfect for any occasion. Fresh penne pasta cooked to perfection, crisp onions, tomatoes, and feta cheese tossed in our classic olive oil dressing. A light salad that is sure to please everyone around the table it sits on. 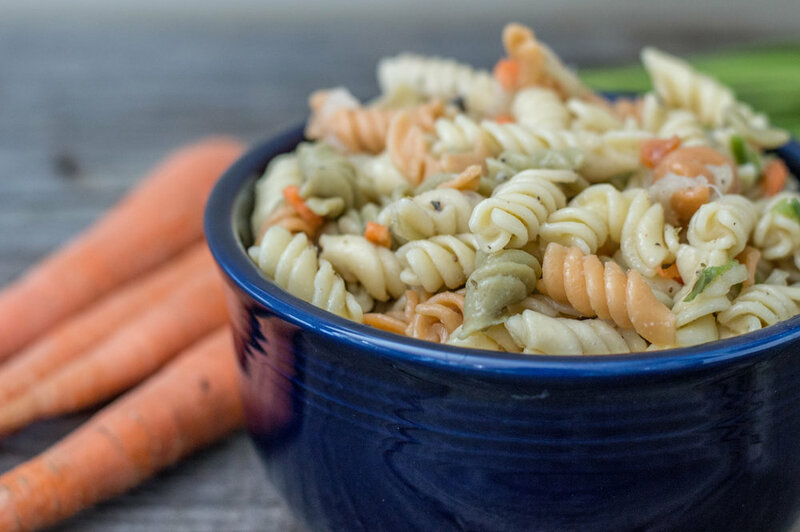 Fresh rotini pasta, crisp vegetables, spices, and sweet Italian dressing round out this classic pasta salad that is perfect for any occasion. Spaghetti has never tasted so good! A combination of carrots, onions, and red and green peppers mixed with an oil and vinegar dressing. Very light and delicious! You can't find anything like this from anyone else! This salad combines radiatore pasta with peas, sunflower seeds, and an assortment of fresh vegetables topped off with a sweet dressing sure to make you smile. Crisp pieces of bacon, fresh bowtie pasta, premium cheddar cheese, tossed in our classic sweet dressing. Super delicious every time! Nothing can beat a classic macaroni salad! Ours is filled with fresh macaroni pasta, crisp vegetables, spices, and a creamy, traditional dressing. It has been a customer favorite for a long time! We took our creamy Macaroni salad recipe and added cheddar cheese and real bacon pieces to kick it up a notch! If you enjoy our classic Macaroni Salad you will love this as well! A sweet take on our classic macaroni salad. 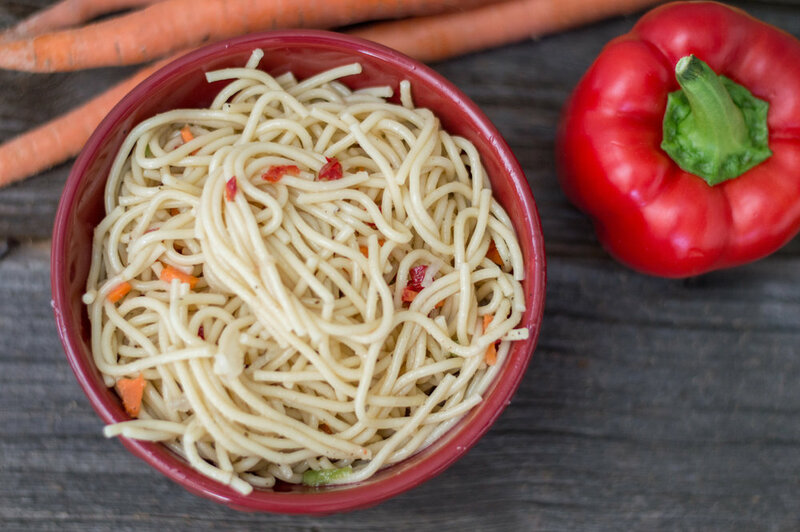 We start with fresh macaroni pasta, add crisp vegetables, and toss it in our secret Heidi's dressing. A classic recipe that is sure to please everyone at your table. We start with fresh spinach and artichoke hearts and combine them with spices that really bring this dip together. You definitely need to try out classic spinach dip. Fresh spinach and seasonings tossed in our traditional dressing make this a dip a crowd pleaser every time. This one is straight up delicious. Black beans, salsa, jalapeno, cheddar cheese, seasonings, and our signature dressing top this one off. Watch out, because once you put it out on the table, it will not last long! Classic southwest flavors are combined into this delicious dip that is sure to be a hit at your next gathering! If you are a fan of blue cheese dips (or just blue cheese in general!) then you will love this one. The cooling flavors are a perfect pair for your favorite spicy foods! This one will rock your socks off! Fresh cheese, creamy garlic dressing, and the perfect blend of simple spices make this dip a tasty one for sure! Our dill-based veggie dip is a great complement to all your favorite fresh vegetables. It has a robust dill flavor that is sure to please everyone at the table! We like our slaw traditional! It is a mixture of fresh cabbage and vegetables in a sweet, creamy dressing. Our slaw is perfect piled high on your pork barbeque sandwich or great in your picnic basket. 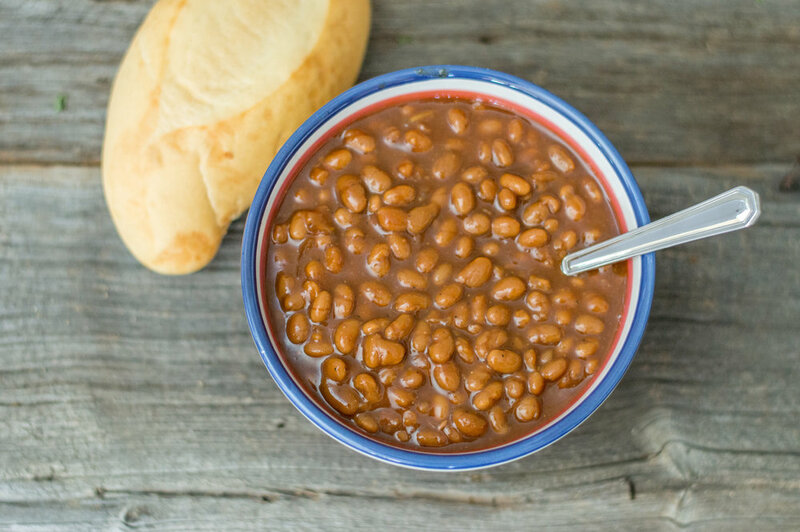 Our baked beans are always a hit! Slow-cook them at home and they become the perfect side dish for any picnic, barbecue, or pig roast! Just like grandma’s, minus all the work! It is a traditional applesauce made with fresh Michigan apples combined with cinnamon and sugar. Our applesauce is the perfect addition to any meal. A traditional holiday side dish (but it’s great all year long too!). Simmered with cloves and spices, they taste just like grandma’s pickled beets. It is a combination of beets and onions—simple yet delicious! A beautiful arrangement of green, wax, and kidney beans mixed with white onions in a light, tangy dressing. This popular salad is sure to add color and flavor to any table. Most say this is the best three-bean salad they’ve ever had! Fresh eggs tossed into our tangy dressing. It tastes homemade. Enough said. We took my mom's cheesy potatoes and brought them right to your table! This is a perfect side for any dinner or breakfast meal. Just heat and serve! Cherries. Oranges. Pineapple. Coconut. Marshmallows. Need we say more? This tastes like it sounds—light, fluffy, and delicious! The perfect blend of strawberries, pineapple, marshmallows, and whipped cream. It's awesome sauce! Fresh bread. cinnamon, sugar, and raisins. It's actually really delicious! MMMmmm....! This sweet treat will light up the face of everyone around your table. Fresh fruit, sweet cream cheese, and cinnamon make this a must try! A classic holiday salad with cranberries, apples, and oranges—the perfect side for all your holiday meals. This one is delicious! These sweet potatoes are just like the ones Grandma used to pull out of the oven on Thanksgiving Day! It is the perfect blend of sweet potatoes, brown sugar, and cinnamon. We regularly work with our customers to develop new products and recipes that fit the needs of their specific markets. If you have an idea for a ready-to-eat product that you are looking to introduce, but need some assistance bringing it to market, please give us a call. We'd love to talk through what it would look like for us to help you take it from idea to store shelf! If you are looking for a partner that can produce your ready-to-eat product, please consider us. We private label numerous ready-to-eat products for well-known brands and we would be happy to discuss what it would look like to produce your product as well. What drives us? How do we measure success? What is our heart, our heartbeat? Why do we do what we do? Learn more about who we are and what we care about below. We exist to bring people to the Table for Captivating Experiences and Meaningful Relationships. 1. Craft We believe creating and making food is a form of art, a craft of which we are proud to be engaged. 2. Flavor We believe the foundation of great food is exquisite flavor and that exquisite flavor is born out of innovative recipes and fresh ingredients. 3. Fun We believe in having fun in our work and enjoying life together. 4. Family We believe the time making and eating food is sacred and meant to be shared with others. 5. Community We believe we have a responsibility to use the talents and resources we have been given to serve and invest in others. 6. Faith We believe our work should honor our creator and savior Jesus Christ and the principles established in his Word.